On Friday 27th January Daniel Heffernan (2009) bravely took on the responsibility to assemble the UK-based old boys, the first such dinner in several years, and his efforts paid off handsomely as 38 of us turned up to the salubrious surrounds of the Cavalry and Guards Club on Piccadilly (Dress code: Jacket and Tie, No Trainers). Thanks to James de Boisanger (2009) for securing the venue. The club dates from 1890, a good 40 years before Glenstal welcomed its first 7 pupils in 1932, but the building itself was constructed in 1875 or so, and we were all far too polite to mention that our school pre-dated that by the same margin of 40 years. And speaking of ties, there was some heated debate about which was the “real” school tie, with Leo McGrath (1962) and a few other stalwarts wearing the original black one that I remember from my days, but the majority of the room turning up in what I’ll always think of as the Father Andrew grey+red version. Factions started forming, but peace was declared when the delicious food turned up. We had a beautiful large room to ourselves, with a few severe military portraits looking down on us, creating an effect not unlike various housemasters disapprovingly supervising our table manners in the Glenstal refectory. Diplomacy forbids me from comparing the quality of the menu to Glenstal’s legendary culinary treats, but the wide choice of fresh food on a constantly-replenished buffet table meant that no-one was complaining about either quality or quantity. There may also have been some wine, I was reliably informed when I woke up the next morning with a mild hangover. Br Colmán gave the group an update on what was going on in Murroe, and encouraged us all to come and marvel at the new academic block, so that we could all complain about how much harder/colder/less cushy it had been in our day. But I suspect that every generation says the same. Colmán then gave a very warm and charming blessing, and we were unleashed on the buffet. 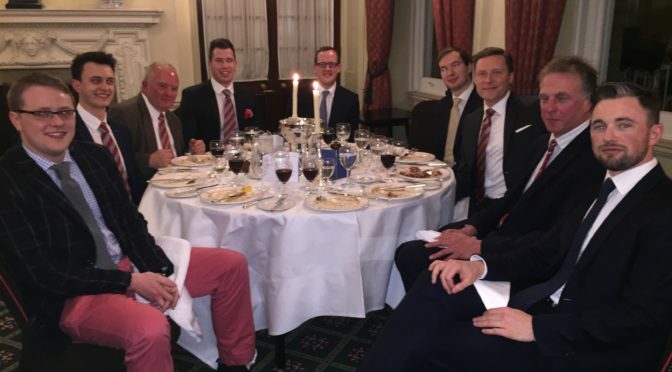 Conversations over the champagne welcome and the dinner itself varied greatly, and you’ll be surprised to hear that Brexit featured more than once. Several people commented that the median career for the UK old boys had shifted markedly in the last 10-15 years, when it had once been primarily legal careers, whereas the younger group (and yes, I count myself among the younger group) seemed to have more of a finance background. Colmán kept guessing “in the law, then?”, but he kept finding financiers wherever he looked, from Lyons O’Keefe (1990) to Rupert McCann (2000) and of course Daniel himself. Most importantly of all, the history of the school was well represented, ranging from the recently graduated Eoin O’Loghlen who left in 2016, to ever-so-slightly more established alumni such as Billy Lee (1957) who came over from Brussels for the night, and Richard Carrigan (1961) who travelled from Dublin to join Mark Carrigan (1995). The success of the night was proved by the huge number of thank-you emails that everyone circulated afterwards, which eventually had the desired effect of luring Daniel into offering to arrange another reunion in the very near future, with the tantalising added possibility of some interim sporting events in case we all miss each other too much. Big thanks to Daniel for arranging and to Leo and Colman for making it over and being such good company.